SINCE 1944--A few summers ago, while traveling home from the Midwest, we came across an unexpected bonus to our vacation as we discovered countless country fairs of all sizes in cities and villages. Each fair along the way in was different, however, each had a certain indescribable Americana in common. 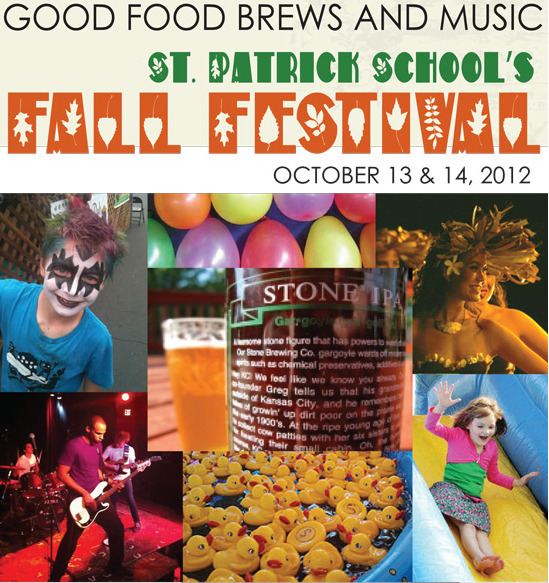 This weekend (Oct. 12 & 13) in San Diego’s historic North Park neighborhood, St. Patrick’s school and parish is putting on its version of a county fair. All the trappings (except ferris wheel) of the hokey goodness that makes community fairs great, will be packed into this one square block of happiness. Called the St. Patrick School’s Fall Festival, the free event includes two full days of non-stop food, craft beer tent and entertainment from local studios and bands. The popular beer tent is sponsored by the Stone Brewing outlet in nearby South Park. The school’s Hispanic Society was tasked with providing authentic Mexican cuisine. Other food is arriving from other tasty sources, including Hillcrest’s Hash House A-Go-Go. Weekend football games can be watched at Sully’s Pub, which makes its annual appearance. Granny’s Attic, the largest rummage sale in the ‘hood will be open both days. Games abound, including the obstacle course and the carnival booths. There will be face painting and hair fun in the Rockin’ Restyle Room. Coopers books has a booth as does the Art Attack Craft folks. Fall Festival Hours: Sat. noon to 9 pm an Sun. 11 am until 7 pm. Tip: rummage sale opens at 7 am on Sun. Where: 3500 block of 30th at Dwight Street. If street parking gets tight remember there’s a huge parking facility nearby at 30th & North Park Way.